THE BULLIES OF GREENBLUD!! 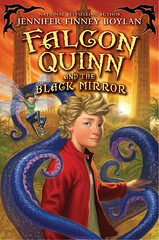 Falcon Quinn and his friends are monsters– a Sasquatch, a Chupakabra, a wind elemental, a Frankenstein– but now they confront the scariest challenge of all: 9th grade. Disguised as humans, Falcon and friends are in a race against time to find five monsters hidden in a New Hampshire high school. 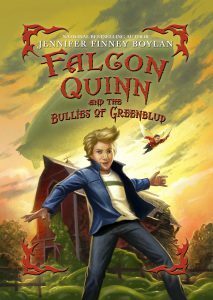 An exciting adventure as well as a serious look at what it means to be differe nt–FALCON QUINN AND THE BULLIES OF GREENBLUD is a hilarious, moving look at bullies and the bullied, at monsters and humans, at boys and girls–and adults–of all kinds. Available as a Kindle book for a scant $2.99— or in paper for $12.99. All proceeds go to support anti-bullying projects at GLAAD. That’s Falcon approaching, the Academy’s Zeppelin in the skies above, an evil green Slime bubbling out of a barn in the background, and a new powerful adversary over his shoulder: CRUMPET THE FAIRY. Also, please check out these first few pages of chapter one, entitled, “Up in the Air.” Monster up! The Zeppelin drifted gently above the Berkshire Mountains, bearing its crew of aberrations. Standing on the observation deck at the back of the blimp, Falcon Quinn’s wings fluttered in the summer breeze. Everything was quiet in the world below. Falcon folded his wings so they lay flat across his back. “Thanks, Max.” He held the styrofoam cup of hot chocolate in his hands, and the warmth spread through his fingers. It felt good. Max looked out over the horizon. “This is so awesome! Us up in the clouds! Our lives—-“ He paused mid-sentence to raise the cocoa to his lips, and then shoved the whole thing, cup and all, into his mouth. Hot chocolate dripped down his Bigfoot face. “—are unbelievably, amazingly great!” Then he roared. The sound of Max’s jubilation echoed on the green hills beneath them. “I’d like to,” said Merideath. “I’m not using that any more,” said Falcon. Sparkbolt, a young Frankenstein, lurched out onto the observation deck. “Rrrr,” he said. Sparkbolt thought it over, then took a bite of one of the donuts that lay upon a golden platter. Powered sugar coated the Frankenstein’s lips. Sparkbolt looked at Falcon Quinn. “Friend,” he said. Mrs. Redflint, the Dragon Lady, came outside to join them. She was the Dean of Students, back at the Academy for Monsters. Their school, on an island in the Bermuda Triangle, was hundreds of miles behind them now. They’d left the island at dawn the day before. “It wasn’t needless, Mrs. R,” said Max. “I was totally grooving on some hot chocolate! It’s got these awesome mini-marshmallows in it! They make me happy! Whoo, yeah!” He roared again. “He’s not going to like being turned into a human,” said Falcon.